Since the days of treasure hunters and pirates there has always been a drive to find something hidden and unlock mysteries. We may all remember the scavenger hunts of our youth... Find a sock, Get a roll of TP or a Needle and Thread from the neighbors. Fast forward to the modern age of Pokemon Go and you have a digital version of a similar concept. Who gets credit for the Scavenger Hunt? Credit for the Scavenger Hunt truly belongs to Jazz Age gossip columnist Elsa Maxwell. In 1927 she hosted a party in Paris which asked guests to find certain items during the evening. Some of those items included music-hall star Mistinguett’s shoe, a black swan from the Bois de Boulogne, the red pom pom on a French seaman’s hat. Before it was over, Mistinguett had to entertain barefoot at the Casino de Paris, a ferocious swan sent two people to the hospital, and interior decorator Elsie de Wolfe, wife of British diplomat Sir Charles Mendl, was accused of theft by the French Navy. Well today we may not be stealing things off of people or knocking on neighbor's doors but CityScape Adventures provides you and your group a similar experience. By creating a digital Scavenger Hunt just for you, your group will unlock the secrets of the city, complete silly challenges and document them with your camera which will then be produced into a hilarious video you can share with anyone you'd like. It's a fun and easy way to get your family, co-workers, team or any other group together to create memories to last a lifetime. Make it Personal?? We certainly do. 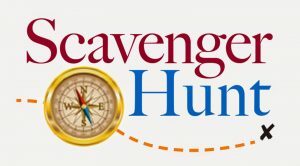 Each Scavenger Hunt event is developed with you in mind. Whether its a birthday, bridal party or any other reason, we use your intel and pictures to make the event special for you. Silly and sometimes embarrassing questions will be presented to your group to make it a little more fun. Work related??? We can customize the event to achieve your goals. Maybe it's team building, celebrating success, new year kick off or product launch, we can create an amazing event for you and your co-workers or clients. A CityScape Adventure Scavenger Hunt usually lasts about 2 hours and is less then 3 miles walking or public transportation. As long as your group has a mobile device you can have an adventure that you'll be talking about for a very long time. So what are you waiting for? Let us help you host the best event in town! Want your own Scavenger Hunt? Allow two weeks for production of your event.